Any activity that keeps you moving is good for your health. Many people choose sports to get their exercise, whether an organized team sport or solo endeavor. Working hard on a field or court or track builds stamina and is a great cardio workout. Unfortunately, playing hard can also lead to body injuries, most notably back pain. It’s important to understand the sport you’re getting involved in and the ways the activity can strain your back. Having this knowledge ahead of time can help prevent a back injury. While athletes usually pursue a game or exercise with good intentions, they may give little thought to how the activity could affect their body in negative ways. Lower back injury: Movement such as repetitive impact (running), twisting motions (golf), and weight loading (weightlifting) can cause lower back damage. Upper back injury: The middle of the spine is less likely to suffer injuries because it is well-supported and relatively immobile. 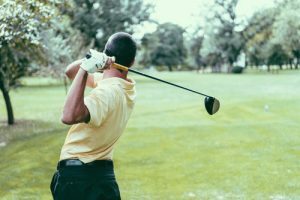 Upper back injuries can still occur, however, and may include rib fractures or muscle strains, particularly in sports that involve the torso rotating, like golf, tennis, or swimming. Neck injury: Contact sports threaten a person’s neck, also referred to as the cervical spine. Football is a major offender in this category. Weight lifting: It should come as no surprise that weight lifting is a major problem for the lower back, straining muscles and potentially causing ligament injury. This form of exercise that involves flexing or extending the back muscles can be good for spinal health but, done improperly, it can cause serious pain and put stress on the soft tissues and joints. If any disc degeneration or osteoarthritis in the spine is present, strain could be even greater. Bicycling: Biking is an excellent form of aerobic exercise but back injuries can occur. A rider’s forward-leaning posture on a bike can cause lower back strain. Neck pain and upper back pain can also occur because of how the head is held and the neck is arched back. Many people with lower back pain favor stationary bikes for better positioning and a low-impact workout. Biking over rough terrain can increase the chance of jarring and spine compression. Golfing: Golfing is commonly considered a leisure sport and low-impact aerobic exercise (if you walk the course), but the twisting that comes with getting a good golf swing is a hard rotation for the spine, leaving the lower back and spinal muscles susceptible to injury. Even bending over to pick up a golf bag and carry it on one shoulder can strain the back. If you are an athlete, you need a medical team behind you to help you prevent and transcend any back pain or injuries. Connect with the functional medicine team at the Restorative Wellness Center in Ann Arbor. Contact us to schedule your consultation whether you are starting an exercise program or in the throes of existing back pain. Diabetes: Prevent It. Control It. Contact our office for relief. We get great results, and we love to help. Call (734) 661-8100, or send us a message on our Contact page. See map to our office here.